Bad news, Droid owners. Android OS version 2.0.1, which all up-to-date Droids are running, has a bug that makes it fairly easy to bypass the phone’s screen-lock security mechanism. The security feature, when working, requires users to input a pattern using onscreen dots before they can access most of the phone’s features (the iPhone offers a similar option). Android isn’t the first smartphone OS to fall prey to security bugs like this. 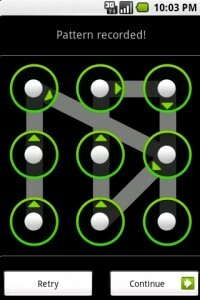 In August 2008 a similar flaw with the iPhone allowed people to easily bypass the phone’s lock screen.